Yahoo Bing network, the perfect adsense alternative is a combined search advertising marketplace made up of Yahoo!, Bing, and partner sites. And the whole inventory of ads from this market is brought to publisher websites via Media.net's ad serving platform. In simple words, it is exactly similar to Google adsense and is a contextual ad program. That means the ads are displayed by scanning the content of the page and selecting the most paying relevant ads. 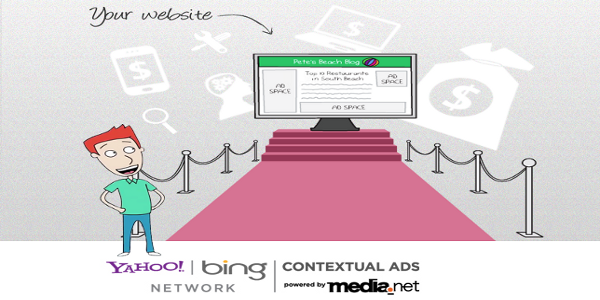 Features of Yahoo Bing Media.net ads. 1. Targeted ads - All ads are contextual and displayed based on the page content just like adsense. 2. Customer support - This is something Google's adsense nearly doesn't have. Only the big players get to reach anybody in adsense or get customized ads. But with Yahoo Bing network, each publisher gets a customer contact person you can mail to for any queries or help. If you have any specific posts on your blog with high traffic then you can list out those keywords as keywords hints to your representative and they will target those keywords to maximize the CTR. 3. Ad formatting - You can customize the ad color and fonts to aptly match your website. The variety of ad sizes is actually much more than Google. All the common sizes like 300x250(small rectangle), 336x280(big rectangle), 160x600 (leather board) are present. You can preview all ad sizes here. 4. Earnings - Most Yahoo Bing ads are CPM (cost per thousand impressions) based ads. 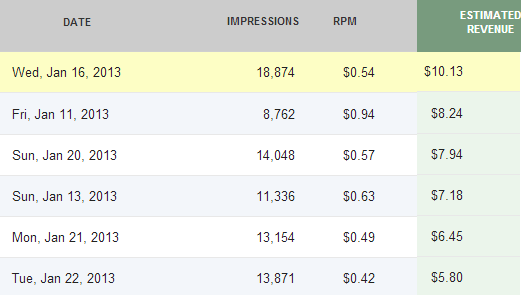 The ad CPM can range anywhere between $0.5-$2 which is almost similar to adsense. Although the exact share percentage of revenue is not disclosed by Yahoo, it is much similar to adsense if not a bit more from experience. 5. Payout Methods - You can opt for one of two payment methods - Paypal and wire transfer. That mean's unlike adsense, you don't have to wait for the courier boy to bring your check. 6. No ad restrictions - You can place as many Yahoo Bing ads on a page as you like. You can also add Yahoo Bing ads along side other providers like adsense without violating any T&C's. Since the network is Yahoo/Bing, the ads doesn't effect your page loading speeds as well. 7. Domain restrictions - Unlike adsense, you can only add Yahoo Bing ads to approved domains. If you trying adding the ads to other domains, they simply won't show up. So if you have multiple sites, apply for all of them at the same time. Although the ads are served from the Yahoo Bing network, Media.net is the point of contact and deals with displaying ads and paying the publishers. So the fist thing to do is to register an account with Media.net. To get approved, Media.net says your site should be in English, having majority traffic from US/UK/Canada and have a reasonable number of visitors. Although no hard and fast rules or numbers are stated, if your site has quality content, you surely will get accepted even if your site is small. While registering, you can give up to 5 sites as well. Don't worry if you don't get approved the next day. It usually takes a week or two as each website is scrutinized by Media.net before approving. For Skipser.com, the acceptance mail came 5 days after submitting the request. 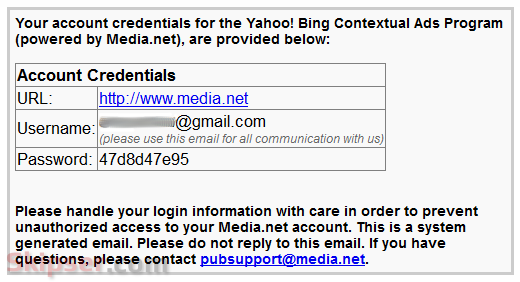 Setting up Yahoo Bing Context ads. Login with the credentials from the approval mail and you will reach the dashboard. The rest is nearly the same as with Google adsense. Just click on the "Ad Units" link at the top and you can create new ad units or edit existing ones. You can choose from a variety of layouts and sizes each of which can be previewed here. The ads are also customizable with your own colors and fonts as well. 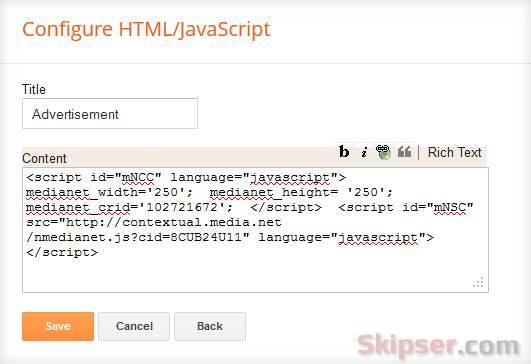 Once you have created and formatted your ad, click on "Get Code" button to get a small piece of code which you can copy-paste to your site's code at the location you want the ad to appear. 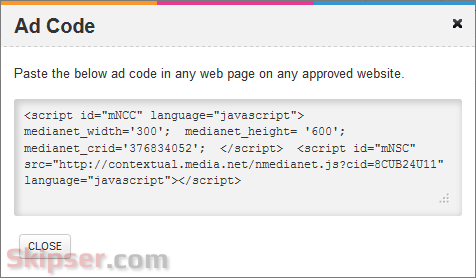 That's it, once you add the code, ads will start appearing immediately unlike Google adsense which takes a minimum of 10 minutes. 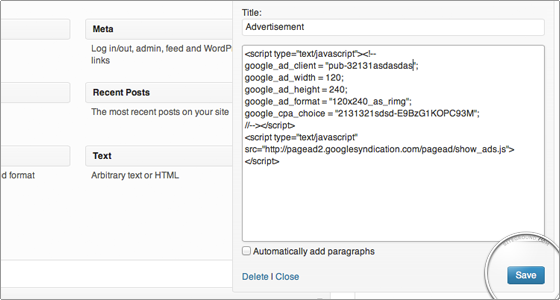 Adding Yahoo Bing ads in Wordpress. First login using your administrative credentials so you reach your dashboard. From here, select Appearence -> Widgets. From the list of widgets, drag and drop a "Text" widget into the sidebar. Add a suitable title like "Advertisement" and copy paste the ad code from your Media.net dashboard as the content of the widget. Click "Save" and you are done. Yahoo Bing Media.net ads will appear at the position where you added the widget. Please make sure that your ad width is less than or equal to your sidebar width to ensure the ads get displayed fully. Tip: Make sure that your blog domain is approved by Media.net before adding. The ads ads are domain specific and will show up only for approved domains. 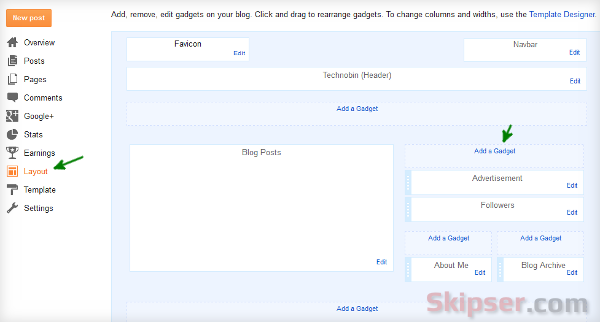 Adding Yahoo Bing ads in Blogger/Blogspot. 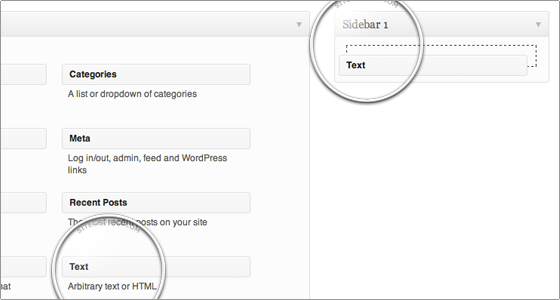 First login to blogger and select your blog to reach the main dashboard. Select "Layout" from the left menu. That's it, the ads will start appearing on the blog instantly. If you are using a custom template code of your own, you will need to add it to the template code appropriately. Yahoo Bing Media.net ads is definitely an apt competition for Google adsense. At the time of writing this post, Yahoo Bing network even has more than 30% of the total ad market share and growing. Although this is less compared to Google's 66%, the fact that Yahoo Bing network is relatively new whereas Google has been there forever makes it attractive. Yahoo Bing ads is the best adsense alternative for anybody who got rejected or couldn't get accepted. And for those who already have an adsense account, you can place yahoo ads on your website along with adsense ads to generate some extra cash! I got approved in media.net but the ads are not showing in my site. I have created and added ad code to my site. I didn't modify the code. I got the code as asynchronous after creating ad. What should I do to remove asynchronous behavior. You are right, media.net seems to have rolled out the async code recently and it is not working... I tried myself. But here's how you can make it work. Just re-write the code in non-async format below. I have replaced cid and crid values for your account, so just a copy-paste should work. Thanks Arun. I have changed my code. It seems the alternative ad is working instead of the original. Great post. Thanks for valuable information! Yahoo Bing Network is managed by Media.Net and they are manually selecting the sites which they found suitable for their ads network. Every ad network including adsense do screening. But you are right, Media Net's screening looks like a bit more intense. Hi, I just approved by media net for my website exeln.com and I put some add units on one of my subdomain http://eng.exeln.com/. These are working fine. Can you please let me know that Adsense is better or Media.net as I am new Indian Publisher. Hi Arun, I'm very new to ads. steptoinstall is my site. I applied for google ads before 6 months. still pending request. Better can i use any other? Hi Arun ! I got approved by media.net and tried to put ad code on my website but it doesn't work. What could be the reason behind it? If I place adsense code in the same place, I can see the ad running but not media.net ads, why ? Could you sort out my problem please. Arun my page is getting slow after putting yahoo ads.Probably google ads are asynch and yahoo NOT.Is there any way to make yahoo ads asynch? They do have restristion on per page ads. You are allowed maximum of 3 ads per page.